Does Innovation Need More Power? Strategy-1 - Empower the Quest! solutions, or ways to bridge or augment our knowledge. can see them more clearly. or theories to help us erase our knowledge-deficit. Strategy-2 - Propel the Momentum! => the change in structure or paradigm behind the "problem"
change in the way they are structured? challenging assumptions, traditions and comfort levels. Strategy-3 - Energize the Process! answers will lead you to successful ventures. by keeping your objectives clearly in mind. and expectations in front of the group all the time. => Work with or on things with greater levels of efficiency. Bill Thomas is publisher of leadership skills training materials. courses and programs. 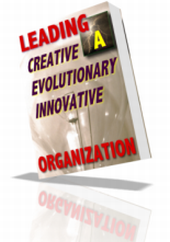 "Leading Creative, Evolutionary, Innovative Organizations!" is a Manual that shows you how to quickly and effectively assess your situations, identify and apply highly profitable solutions while you leverage small or large innovative opportunities for growth, prosperity and success!